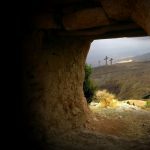 Holy Week may be something new for you or possibly you’ve wondered what each day signifies and were afraid to ask someone. Never fear, we have broken down each day and its significance. 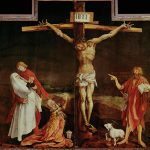 The theme of Holy Week is Jesus’ passion: his suffering and death on the cross for our salvation. Also referred to as The Sunday of the Passion: Palm Sunday. 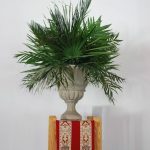 Palm Sunday has a dual focus: Jesus suffering and death on the Friday of Passover and also his triumphal entry into Jerusalem only a few days before. The word maunday is derived from the Latin, mandatum, which is our English word mandate. 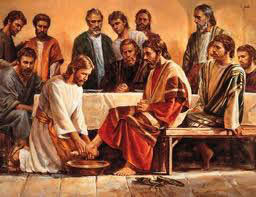 Therefore, Maunday Thursday gets its name from the mandate Jesus gave his disciples after he washed their feet on the Thursday of his final week. On Maunday Thursday, we commemorate Jesus washing the feet of his disciples followed by the Holy Eucharist instituted at the Last Supper. “Stripping the altar” concludes the service. Stripping the altar is the removal of all ornaments of beauty from the sanctuary. At the completion of the practice, the sanctuary is barren and dark. 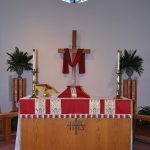 The reserved sacrament, or blessed bread and wine, are removed from the sanctuary and placed in the altar of repose, a designated place lit by candles, where parishioners may sit and pray silently. This location commemorates the Garden of Gethsemane where Jesus silently prayed. wear solemn black cassocks rather than wearing traditional colorful garments . This is the day the church celebrates the resurrection, or Jesus being raised from the dead and overcoming death and the grave. It is the highest holiday in the church year. The music during the service is upbeat and contains Alleluia. During this service, the Paschal Candle, or Christ Candle, is placed in a prominent place and lit as a symbol of Christ’s light in the world. Since Easter Sunday symbolized a time of new birth, baptisms of new initiates into Christianity take place.